Dan grew up in Southwood Park. While finishing his culinary arts degree at Ivy Tech, he participated in a foreign education program, touring culinary schools, restaurants and wineries in southern France. He worked at Catablu for nine years, starting as a bus boy and working his way up to sous chef. After five years as sous chef, he began his own journey at the Friendly Fox. Kendra grew up in Michigan and moved to Fort Wayne in 2000. She worked for 10 years at Catablu, where she met Dan, her husband and co-owner. Dan and Kendra have been together for eight years and have been happily married for three. Kendra has also been a hair stylist for seven years. Matt grew up in Fort Wayne and went to Homestead High School. 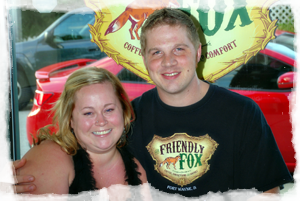 He has worked as a cook at Chappelsand Casa Ristorante in Fort Wayne and was a part owner at Kicked Up Catering in Grand Haven, Mich.
Becky’s family grew up in Southwood Park, and she’s the niece of previous Friendly Fox owner, Trish Fox. She attended St. John the Baptist, Bishop Luers and the University of Saint Francis, earning a bachelor’s in social work at USF. 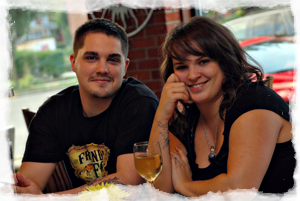 Becky has seven years of restaurant experience, and is engaged to owner Matt Capps. They are the proud parents of Ruby, and look forward to raising her in Southwood Park. Are you guys kid friendly for all meals? Heard there were two new Foxy babies born this summer! Their names – and PICS . . .